In Ep. 63, the interviewer becomes the interviewee. Tom interviews Tim in this episode about his role at Mullooly Asset Management, how Living With Money got started, what he’s learned through years of podcasting and being an investment advisor, and some important lessons he learned earlier in life back in high school and college. 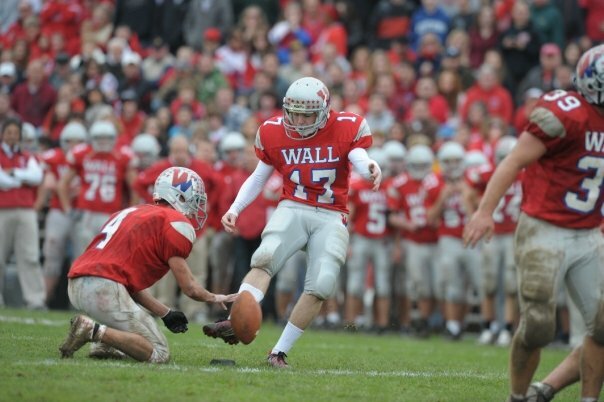 Here’s me kicking a go-ahead FG in high school. I swear I didn’t make that up! Tim Mullooly: Welcome back to Living with Money. This is Tim Mullooly. Doing something a little different on today’s episode. Tom is here with me. Tom is actually going to be interviewing me. We’re going to turn the process around a little bit. Tom, take it away. Tom Mullooly: Here. You had interviewed me in one of the very first podcasts for Living With Money. Tom Mullooly: We never actually got around to doing this side. I’m glad, after a year now, we can set aside some time to do this. You have been an investment advisor here at Mullooly Asset Management for almost five years. Tom Mullooly: And some things not anticipated. You want to talk a little bit about that? Tim Mullooly: Like you said, coming up on five years. I think August is … would be five years of when I started here. Graduated college back in 2014. Started at the end of that summer. On a normal day, I show up to the office, boot up the computer, doing normal things that advisors … client facing advisor would do. When clients call in, they’ll either be directed to either Brendan or to me. Then, helping clients out with problems, answering some of their questions. Apart from that, I do a lot of the media, pretty much most of the media that gets put out for Mullooly Asset on top of this podcast, Living With Money. I’m usually trying to find topics for us to talk about in videos that we put out every week or podcasts, either for Living With Money or for the Mullooly Asset Management Podcast, and trying to find guests for Living With Money, doing research on the guests. I like to obviously be prepared when I go in to interview someone. I send them questions ahead of time. Tom Mullooly: Do you know how long we’ve been doing this now? Tim Mullooly: I think it’s over two years. Tim Mullooly: Every day. Every weekday. If I’m in the office, sometimes if I’m out at a conference or something or taking a day off, but usually Monday through Friday, every weekday, just a link roundup of some of the best links that I find on a daily basis, usually from Twitter, but also from financial websites like Forbes, the Wall Street Journal, Morning Star, stuff like that. Tim Mullooly: The top links stuff? Tom Mullooly: If they’re not getting it? Yeah. How would they find it? Tim Mullooly: Now it’s being put up every morning on Living With Money at the top of the website. You can go to livingwithmoney.com. There’s a tab that says Tim’s Top Links. You can check in every day there, like I said, Monday through Friday. There will be links there. Usually I think it’s about four articles. I try and sum it up in a couple sentences underneath, so you get a little preview of what the article’s about. That’s been a good way for me to obviously learn more. I’m reading the articles themselves. I’m not just taking the headlines and putting them out. I need to make sure that they’re … it’s good content. It’s also a good way for me to make connections on Twitter. I’ve interacted with a lot of people by linking to their stuff and tagging them in the post. Then they share it to their community. It’s kind of helped build a follower and relationship on Twitter with a lot of people by sharing their content. Tom Mullooly: Some of these connections have actually led to podcasts. Tim Mullooly: Yeah, a lot of them actually. A handful of Living With Money guests have been contributors to the Top Links over the years. That’s how I started following them. They follow me back. I realized that they’re putting out really good stuff and they have really good things to say. They’ve become a lot of really good guests on this podcast. Tom Mullooly: Who would you say are some of the more interesting folks you’ve met through this process? Tom Mullooly: For those that don’t know, Justin is the Fresh Prince of Indiana. Tim Mullooly: Yeah. That’s right. Yeah. Justin has been really great. Brian Portnoy, he wrote the book The Geometry of Wealth that came out last year. That was extremely interesting. Daniel Crosby as well, the behavioral investor, a lot of guys from … people from Ritholtz Wealth Management. I’ve had a few of them on the podcast here, Blair, Kris Venne, Alex Palumbo. Yeah. There’s been a lot of really good connections being made through Twitter and from sharing all their stuff on the Top Links. Tom Mullooly: Tell us a little more about some of the other things that are going on at Mullooly Asset. Tim Mullooly: Yeah, so I mentioned the weekly videos. I think that Mullooly Asset Show is up to episode 133, I think. We’ve done over a hundred episodes. I shoot and edit and put out and manage the YouTube channel. I manage our Facebook page as well, pretty much all of the social media, our LinkedIn, our Twitter. All the social media platforms that we have for Mullooly Asset, on top of my own personal Twitter I manage. Tom Mullooly: Do you use some of these tools like TweetDeck or Hootsuite, or any of these other tools to manage this stuff? Tim Mullooly: I actually don’t. I’m manually putting them out. I probably could utilize some technology a little bit better to streamline that, but no. I usually just … I put them out myself in terms of marketing as well. I got us started with our local cable TV ad a few years ago. Tom Mullooly: Yeah. Let’s talk a little bit about this. Some of these other things, I think a lot of folks would expect us to be on some of these social platforms like Facebook and Twitter and LinkedIn, but talk about some of the other marketing things that you’re doing for the firm. Tim Mullooly: Kind of similar to how we approach financial planning, I kind of approach our marketing way and in a comprehensive kind of view. Obviously, with technology and the internet and you hear about businesses advertising on Facebook and Instagram. We’re doing all of that, but we’re also doing more of the traditional, I guess you could call it old school, style marketing. I’ve found that having all of these different platforms … we have a local TV ad, we run an ad in the paper every week, we have a sign. To be honest, the sign has been really great on … we’re located on one of the busier roads in town here in Wall. Just having a sign out on the corner, people drive by and see that. Tim Mullooly: It’s actually a common phrase that we hear from people when they call in. Our question is, “How’d you hear about us?” They’re like, “Well, I see you guys everywhere so I figured I might as well call.” That’s how we know it’s working. I don’t really see any one particular platform as more important than the other. I think they all contribute. It’s more about being consistent than it is about having this holy grail of marketing that’s new scheme that’s going to get everyone to call. I think it’s just more about being consistent. That’s what I try and maintain on a daily basis, weekly basis, make sure that everything is running smoothly on all of those different facets of marketing. Tom Mullooly: You’re kind of getting your master’s degree in marketing by doing all of this stuff. Tim Mullooly: Yeah. I didn’t study particularly marketing in college. I just had a general business administration degree, but I did take some marketing courses. That was kind of the approach that was laid out in college. Kind of just applied it to the real world once I got here. It’s kind of sparked a new interest for me. It’s not exactly where I thought I was going to go when I joined on here, but it’s kind of become my little niche. Tom Mullooly: Because Living with Money is a completely different website from Mullooly Asset … from the Mullooly Asset Management website. Tim Mullooly: Right. I wanted it to be that way. We didn’t want it to be a podcast that was promoting our business. We chose Living With Money because it’s a pretty broad topic and I … that way intentionally. It started out interview authors of financial books, people, like I mentioned, from Financial Twitter who are advisors or run their own business. We’ve also interviewed people around here in the local Monmouth County area that are business owners, professors. People have said to me, “Well, for me, I guess it’s living without money,” because they’re joking that they don’t have any money to live with. I get the joke and it’s funny, but that’s not really the point of the name or the point of the show. The point of the show is to show that everybody has different experiences with money and to kind of show some common ground in between problems that people have with money, whether you’re living with a lot of money or you’re living with a little bit of money. Sometimes people feel isolated or this problem might only pertain to them, so I kind of wanted to have people on from all different facets of the money-related spectrum to show that we’re all kind of connected in terms of everybody needs help with money, whether you’re super rich or not rich. That was kind of the main goal of the podcast. This’ll be episode 63. We had our one year anniversary back in January. It’s been a good learning experience for me, too, and again, another way to build relationships with people who I probably wouldn’t have met or talked to or learned about their story without the podcast. Tom Mullooly: Or a podcast channel, but it’s actually taking on a little more life. You want to share what’s happening? Tim Mullooly: Yeah. You’re right. It did initially start as just a podcast. Over the last couple weeks, I’ve been posting more. Like I said, the Top Links are going on there every day. I posted more blog posts in general. It’s kind of just becoming my own brand, I guess in a sense you could say, with blog posts, podcasts, links, just putting a lot more content on the website itself. There was a little self-serving motivation there in the hopes that if I interview all of these people I’m kind of not pumping up the Mullooly Asset Management brand, but more just getting my name out there, because as a young person in the financial industry, it’s sometimes is hard to make a name for yourself if you’re not a well-established veteran. Tom Mullooly: I think that makes a lot of sense, because way back when, when I got started in the business, the way you built up your business was smiling and dialing. Tom Mullooly: Now. You’ve been doing this now for about five years. Tom Mullooly: For someone who is thinking about getting into this line of work, how would they get clients? How would they build a business from a standing start? Tim Mullooly: Someone my age? It is tough, but I’ve tried to at least show that … show what you’re capable of in a different way by building relationships with people in the industry, trying to gain some credibility that way. Hopefully people will be able to see through your work, the stuff that you’re putting out, that you know what you’re doing and that you can be trusted. Tom Mullooly: I think you hit on a couple of really important parts there in the sense that there may be the potential client out there who deals with an advisor but they realize that the advisor has a gigantic book of business and they’re only small part of it. Working with a newer advisor kind of gives them the opportunity to get more attention than they would’ve gotten at a big brokerage firm or with a bigger advisor. Tim Mullooly: That just reminded me of something that I talked about with Alex Palumbo from Ritholtz Wealth Management on this podcast. He is also my age. We’re both young advisors. One point that he said that he makes to clients … because he’s working with clients that come to their firm. They get assigned to him. One point that he makes is they’re getting … usually closing in on retirement. They’re getting ready to retire. You don’t want, necessarily, an advisor who is also getting ready for retirement. You want an advisor who is going to be there for you to get you through those retirement years because people are retired for longer and longer today. Retirement could last 30 years. If you have an advisor who’s near the end of their career, you might get passed off to someone that you don’t necessarily know very well, so you want to establish a trusting relationship with a younger advisor who’s going to be working his entire career through your retirement. Tom Mullooly: I guess the next natural question for me to ask was has your experience been what you anticipated or what you expected? Tim Mullooly: In that sense, in terms of working with clients and trying to get your foot in the door, it was pretty much what I expected. I’m not bashing people for being immediately trusting of a 25, 25 year old fresh out of college, just a couple years in in the industry. I get it. In that sense, it pretty much was what I was expecting. In terms of dealing with clients on a day to day basis, it honestly is more … it’s not what I expected in that sense. It’s more dealing with people’s emotions and being almost a therapist, a money therapist, than being someone who is crunching numbers on a day to day basis, wheel and deal stocks, stuff like that. That’s not really what it is. It’s more calming people’s nerves during tough times and reining in people’s greed during good times. It’s a lot more psychological dealings than what I expected, so it’s totally different in that aspect. Tom Mullooly: Okay. If someone were looking to get into this business, what areas would you tell them to study or to focus on? Say they’re in college and they’re not sure what they want to do with their career, or they’re out of college and now they’re thinking about a career in this. What kind of things would you tell them to study or to focus on? What kind of books do you think they ought to be reading? Tim Mullooly: Kind of piggy backing off of what I just said, I think potentially a more beneficial major for someone who’s going to be an advisor, or a financial planner, would be psychology because you can learn … I studied for the Series 65 and I’m studying for the CFP. These are courses that you can take after college to learn what you need to learn about being an advisor and becoming a good financial planner. I think one of the more beneficial things that you could study in college is human behavior and how the human mind works. I’m not saying what I learned in college is not applicable, because you still need to learn statistics and all the different other business courses and stuff. It definitely still applies, but maybe pair it with something more psychological in nature and learn more about dealing with people and developing your people skills. One of the books that I think people should read is the Dale Carnegie book How to Win Friends and Influence People. Me and Brendan took a Dale Carnegie course a few years ago. That was really helpful in terms of learning how to interact with people, learning how to communicate your message and also listen to people and, like they say, learning how to properly communicate and listen and get your message across and build relationships with people. Tom Mullooly: In your class. Tim Mullooly: Yeah. I forget the exact title, but yeah. I was MVP. That was a really good course. I enjoyed that a lot. It also helped with the podcasting. Podcasting in general just helped me become more comfortable talking with people. I wouldn’t say that I had a fear of public speaking or interacting with people that I didn’t know, but it definitely wasn’t something that I was comfortable with. I still get nervous every once in a while right before I hit record on a podcast, but through a course like Dale Carnegie and just becoming more comfortable podcasting, it’s helped in terms of talking with clients, being able to communicate better with them, and outside of work, too, building friendships with people, getting to know people that you didn’t previously know. Tim Mullooly: For people just entering the workforce, I think any and all of Gary Vaynerchuk’s books. I read those right out of school. Maybe not necessarily for the down in the dirt tactics that he offers on how to hustle and build your business, but more just to instill some kind of motivation and work ethic. Reading about how Gary does what he does, it’s extremely motivating. He always says, “Don’t try and be me. You take what I’m telling you about how I did my business and you apply it to your own life.” If you read those books, they were very motivating for me, just instilled some sense of having a good work ethic and finding ways to create your own success. I think any of those books by Gary V. If you’re looking for more psychology and finance related books, someone that I interviewed and I mentioned before, Daniel Crosby, his new book The Behavioral Investor is well-regarded as a good behavioral finance book. Tom Mullooly: We’ll link to that in the show notes. Tom Mullooly: We’ll link to all of these books in the show notes. Tim Mullooly: By Josh Brown. Tim Mullooly: Yeah. We all are here. We’re big fans of Ritholtz and all of the stuff that Josh puts out. That was probably one of my favorite books that I read right out of school as well. I would check that out. It’s a good story about … and you and Josh have kind of similar stories in terms of how you morphed from broker world to investment advisor world. Good story. Obviously, Josh is pretty funny, too. You’ll get some laughs out of the book as well. Tim Mullooly: Back in high school? Tom Mullooly: Yeah. You want to share that? Tom Mullooly: You made a very, very stunning announcement at the dinner table one night. Tim Mullooly: Right. I looked at everyone and I just said, “I’m going to play football next year.” The looks that I got from you and mom were like, “Just starting playing football your senior year?” I was like, “Well, let me back up. I’m not going to be playing football. I’m going to be kicking for the football team. My best friend Fred was one of the captains my senior year. He was like, “Hey. I know you played soccer and I’ve seen you kick a ball. You can boot it pretty far. Our kicker is not that great. You should try out.” Our mutual friend who was a couple of grades above us, Josh, was a kicker. He kind of did the same thing, transitioned from soccer player to football player/kicker. He trained me and coached me. Yeah. That was something completely new, something that I thought I would never end up doing. It turned out to be a lot of fun and I was pretty good at it. Tom Mullooly: You had some good success. You want to talk a little bit about that? Tim Mullooly: Yeah. I mean, I only kicked for one year, never missed a field goal. Farthest that I hit in a game I think was 37 yards, but in practice I had made a 50 yarder. There were witnesses. I’m not just making that up. Yeah. I got some offers. It was crazy. Tom Mullooly: There was also a school in Maryland that was pretty anxious to get you, McDaniel. Tim Mullooly: Yeah. That’s right. Yeah, where Casey ended up going for a year. Just a radical decision, I guess, from a sports perspective. Just something that I had never done before. Took a leap of faith and it worked out. Tom Mullooly: What new beliefs about yourself did … could you take away from that whole experience? I mean, you’re 16, 17 years old. This was a big deal. Tim Mullooly: I was extremely nervous going into it, but I worked really hard. My hard work paid off. That was not the first time that that had happened, but it was kind of the reaffirming moment that if I put my mind to it, I can pretty much do whatever I want. You hear that a lot growing up and, to an extent, you believe it, but part of you is like, “Eh, I don’t know if that’s true.” In this sense, that was really the reaffirming moment where I was like, “Oh wow. Something that I never in a million years have done or would think about doing,” just decided to give it a shot, think, “Why not? What’s the worst that could happen?” It paid off. Tom Mullooly: All right. Now, tell us a little bit about your experience in a fraternity and all of that. Tom Mullooly: Because again, I think there’s a story here that is … if more people heard it they would learn a lot more about you. Tim Mullooly: I joined the same fraternity that Brendan is in. Casey’s also a member as well in New York. My junior year I became president of the fraternity for a year. Tim Mullooly: Phi Kappa Psi. Our chapter I became president. That was an interesting year. It was my first glimpse into the world of managing people. As you can imagine, it was pretty tough to get a group of college guys to do anything other than exactly what they wanted to do. In a sense, they were my first clients. We get clients that call in and want to do things. It might not be in their best interest. The same thing happened at school, being president of the fraternity. A lot of people had ideas and things that they wanted to do. I kind of had to step in and say, “Hey, guys. That’s probably not the best thing to do for the fraternity. Here’s what we’re going to be doing.” We all still had fun. I wasn’t the fun killer, but I was more in tune with what needed to be done in the fraternity’s best interest to keep the organization going while also having fun and living our lives and enjoying college. It was a lot of dealing with large groups of people, dealing with the school as an organization, dealing with the national Phi Psi organization, headquarters, going out to different events on a national level, and then also just one on one, day by day, talking with individual members of the fraternity, trying to … if they had a problem, it usually came to me. It was fun. It was definitely challenging. It was more work than I thought, but it was definitely rewarding. Tom Mullooly: It sounds like it certainly prepared you for coming to work. Tim Mullooly: Yeah. Absolutely. It was kind of just another step in growing up and maturing while at school and just getting ready for the real world in terms of dealing with people on a day to day basis, people I didn’t know or people that I wasn’t familiar with and just trying to build relationships with them and be professional. Tom Mullooly: Tell us what you’re doing when you’re not at work. What are some of the things you’re doing? Tim Mullooly: Recently, I’ve been running a lot. Not typically a runner. Over the span of my lifetime, I always enjoyed working out, always was more interested in lifting weights and doing bicep curls and stuff like that, but I always knew running was something that I wanted to do. I just never really found the motivation to do. Next Saturday, April 6th, I’ll be running in the Asbury Park Half Marathon, so 13.1 miles. The whole process of running has kind of been eye-opening in terms of, again what I did with football, just setting your … setting a goal and training towards that and just working hard. Been running a lot, work out, play golf a lot on the weekends. Me and Casey have been playing a lot of golf recently, watching the Mets, watching the Jets, even if they’re not winning, which is most times. I’ve been playing drums for over 10 years. Been in a handful of different bands, whether it’s original bands writing our own music, or cover bands playing here around the Jersey shore area, at bars, making money that way. Also started singing and playing guitar. I’m trying to expand my musical horizons. Who knows, maybe one day I’ll have a one man band where I can play guitar, sing, play drums, do it all. Tom Mullooly: What’s your favorite song as a singer, a cover song? Tim Mullooly: Yeah. I think one of … the first song that I learned to play on guitar and that I like to sing, too, is one song that you told me to learn. It was Take it Easy by the Eagles. It’s a very fun song to play on guitar. It’s pretty easy. There’s like five or six chords. Growing up, that was one of the CDs that we always had in the car, Hotel California, going to soccer games, baseball games. Between that song itself, Hotel California, and Take it Easy, those are two songs that I kind of grew up with. Tom Mullooly: Just the fact that you could hit those notes. Tim Mullooly: Yeah. Yeah. I have somewhat of a higher range as a singer. It was kind of, just again, something that I wanted to do, I thought would be fun, but I didn’t really have any training or practice in. One year, I think either for my birthday or for Christmas, I asked for singing lessons, which was kind of unusual. I got a weird look from mom. She was like, “Really?” I said, “Yeah.” It’s something, when I’m alone in my car, as I’m sure most people do, you sing along to whatever music you’re listening to. I thought, “Wow, I don’t sound half bad. I don’t think I sound half bad.” Through the bands that I was playing in, I would sing along with what we were doing at practice and people reaffirmed that to me, like, “Hey. You actually sound pretty good.” I took some lessons, learned proper breathing techniques and what to do with your mouth when you’re making different vowel sounds and stuff like that, different singing techniques. Did that for a couple months and it was really fun. Now I really enjoy singing. Tom Mullooly: What’s it like working in a family business? Tim Mullooly: That’s my favorite part of what I do. Honestly, I enjoy being an advisor and I enjoy talking with clients and everything else that I talked about before, but if our family business was farming, I would enjoy doing that, too. It’s my favorite part of what I do. I live with Casey. We have a house together, so I see Casey every day. Just coming into work and getting to see Brendan, getting to see you and mom, it’s my favorite part of what we do. Yeah. I think it’s really unique, too. I hear and I’m sure we’ve all heard how, “I don’t know how you could work with family.” It’s like I don’t know how people can’t work with family. It’s awesome. Tom Mullooly: Well, I think this has been a fun episode to record and I’m sure it’ll be a fun one for folks to listen to. 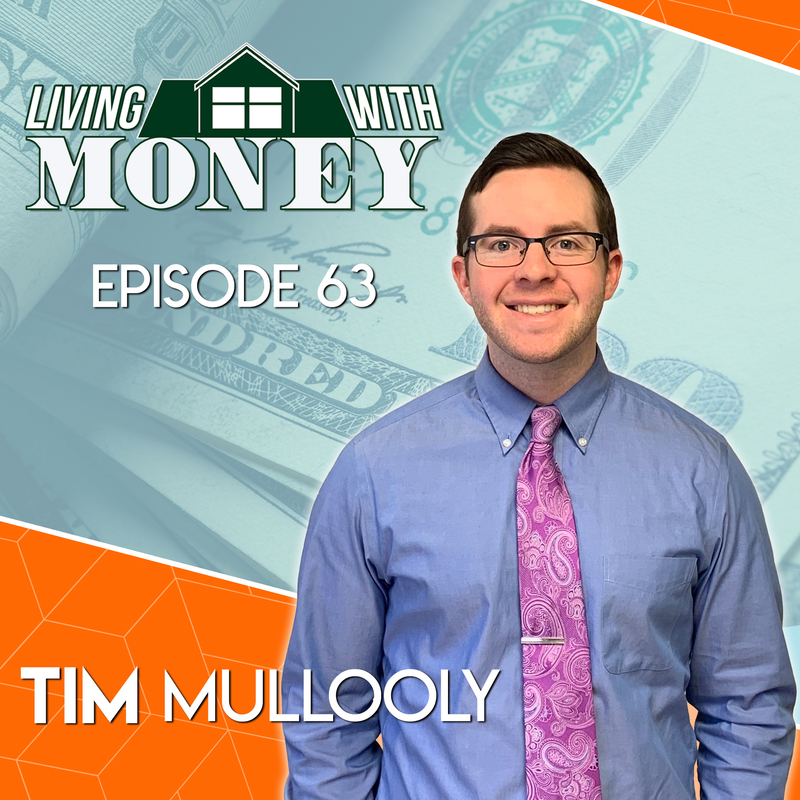 You get to hear the other side of the microphone from our Living With Money host, Tim Mullooly. Thanks for being a great guest. Tim Mullooly: Yeah. This was fun. Hopefully, like you said, people will enjoy listening to it and I will be back on the host side of things next week for sure.